What a wonderful time of the year! Today is the first day of spring. The season of growth and renewal. The sun shines a little longer and brighter. Spring bulbs are poking up through the soil. The birds have started to return from their winter migration. The time for Spiritual renewal and growth is also present. I pulled the angel card for blessings and I am reminded not to take this time of change for granted. Just as nature begins a new season, so can we begin a new connection with God and his angels. Spend time with the angels as you appreciate your surroundings. 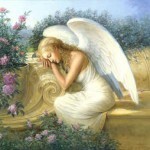 I will talk to my angels as I do my spring planting. I will look for signs from the angels as I notice all the changes in nature. I am grateful for the blessing of spring. God’s Blessings and the angels are everywhere. Renew your spirit.